Do you promote e-commerce items via email campaigns? -What customers are buying - following which ad or offer? -Which pricing tactics got better results? 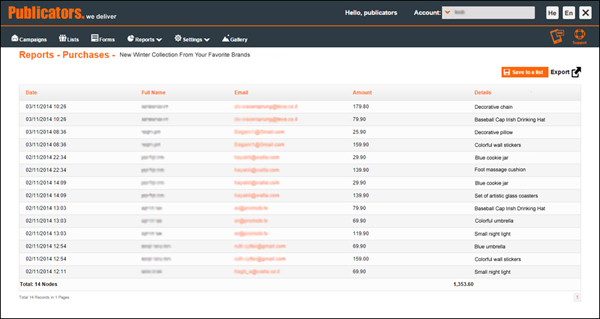 Also, by sending test campaigns to smaller groups you could forecast item popularity, stock issues, and more. As the first winter rain began pounding against windows, one of our clients - a reputed designer accessories shop, launched a campaign promoting their appropriately cozy items. Publicators’ system reports showed them the exact number of customers who clicked on the newsletter and specifically bought that cheery umbrella or lovely cookie jar. A Unique ID will be integrated to each link on your newsletter. Embed code for tagging your website pages and other apps will be assigned and placed, allowing the system - and you - to follow and measure customer tracks on their journey - starting in their inbox all the way to the "Thank you for your purchase” page.